DECA - the DEscent CAmera on Schiaparelli, the ExoMars 2016 entry, descent and landing demonstrator module (EDM) - will reach the surface of Mars and for this reason it has to be properly cleaned to meet planetary protection requirements. 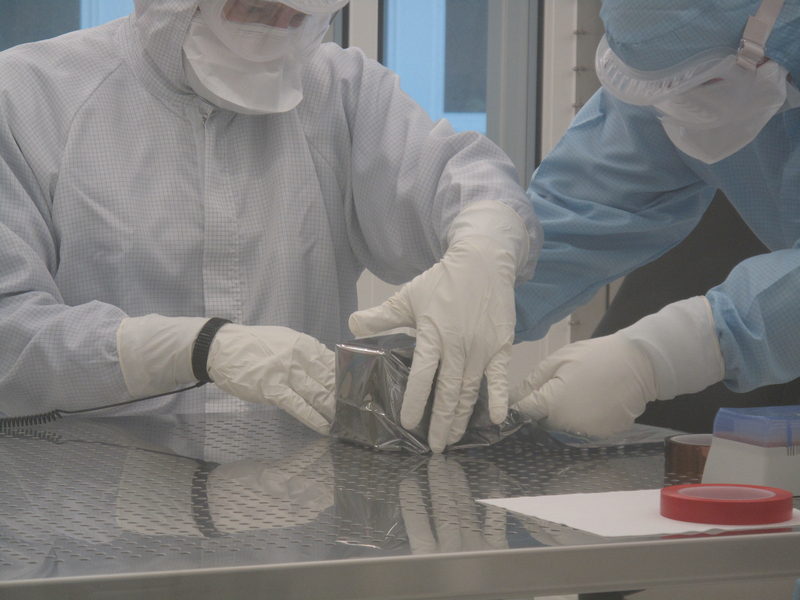 This image shows two technicians in a cleanroom at the European Space Research and Technology Centre (ESTEC) in the Netherlands, sealing DECA into the inner of two anti-static bags, after it has been cleaned. The bags are for protection during transportation to Thales Alenia Space, Italy, for integration into the EDM and will be removed before flight. DECA was designed and built by Optique et Instruments de Précision (OIP) in Belgium for ESA. It is the re-named flight spare of the VMC (Visual Monitoring Camera), which flew on the Herschel spacecraft.